India 0-283 (Shikhar Dhawan 185*, Murali Vijay 83*) trail Australia 408 (Mitchell Starc 99, Steven Smith 92, Ed Cowan 86, Ishant Sharma 3-72) by 125 runs with 10 wickets remaining. 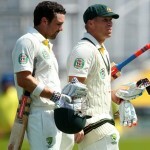 The Australian innings was folded back after a reasonable score of 408 in 141.5 overs. India powered 283 runs in just 58 overs in their first innings with all wickets in hand. The third day’s play finished on Saturday, March 16, 2013, at Punjab Cricket Association Stadium, Mohali,Chandigarh. Earlier, the Kangaroos went into bat at 7-273 in 104 overs whereas Steven Smith and Mitchell Starc were occupying the crease at 58 and 20 runs respectively. The batsmen went in with an aggressive mood, they were sending the ball out of the fence frequently and the third hundred of the innings appeared on board in the 110th over. Starc was not compromising against any loose balls, he gave them the required treatment and rushed to his second Test fifty in the 122nd over. The duo shared a 97 runs stand for the eighth wicket as Steven Smith was caught behind by MS Dhoni off Pragyan Ojha for his career’s best score of 92 from 185 balls with 1 six and 10 fours. Mitchell Starc took over from thereon and he scored boundaries off all bowlers assisted by a nominal contribution from the other end. He remained unlucky to miss his maiden ton by just one run and was caught behind by Dhoni off Ishant Sharma for 99 from 144 balls with 14 fours. The first innings of Australia ended after a decent score of 408 runs while playing off 141.5 overs. Ishant Sharma and Ravindera Jadeja were the top wicket takers with three each whereas Ravichandran Ashwin and Pragyan Ojha shared two wickets each. The Indian innings was initiated by Murali Vijay and the debutant Shikhar Dhawan in a cool manner and they scored just four runs from the first three overs. Dhawan exhibited his dangerous intentions by hitting a couple of fours in the next over and never looked back from there as Vijay kept on crawling from the other end. The boundaries were showering from the blade of Dhawan, he looked unstoppable and rushed to his fifty on even balls with 12 fours. 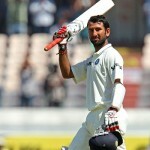 Vijay punished Nathan Lyon for 12 runs in the 18th over with 2 mighty sixes as Dhawan did not change his gears either. Shikhar Dhawan humiliated Xavier Doherty for 18 runs with the assistance of 4 sweetly timed fours. 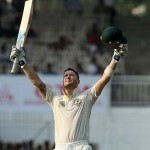 The angry opener blasted his maiden Test century on debut in the 27th over by earning five runs because of an overthrow. That was the fastest Test hundred on debut by any batsman and received applause from the dressing room, the spectators, the fielders, as well as hugs from his partner Murali Vijay. The partnership kept on flourishing as Murali Vijay reached his third Test half century in the 34th over. Dhawan kept on cursing from his end and hit the first six of the innings in the 38th over followed by another 3 fours in the 41st over. The second hundred of the innings was displayed on board in that over as well and Dhawan hit 3 more boundaries in the 44th over. He thrashed his 150 in the next over and preferred to score runs with the assistance of boundaries rather than running between the wickets. India hammered 283 runs without any loss in 58 overs, Shikhar Dhawan was batting at 185 off 168 mere deliveries comprising 2 lofty sixes and 33 well timed fours whereas Murali Vijay was at the other end with 83 from 181 balls with 2 big sixes and 10 fours. India is 125 runs behind the first innings total of Australia and the batting power house of the hosts, especially the duo at the crease, can put them in a winning position on the fourth day.